‘You can’t have your cake and eat it.’ Well actually, in this instance you can – if you are talking about both a bathtub and a shower while saving space in your small bathroom. 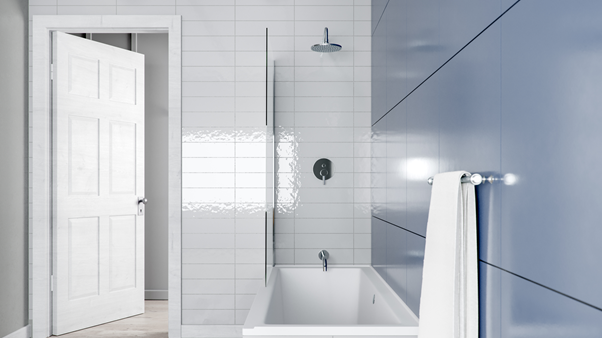 In the world of bathroom design, the bath/shower combination is a win-win solution. Do you prefer a bath while your partner prefers a shower? No problem, because with a two-in-one bath and shower set, nobody has to compromise. Gone are the days of mouldy shower curtains and awkward, impractical hand shower extensions. Bath/shower combinations have stepped into the 21st century with style. Introducing exhibit A: River Range’s Angel set duo which has entered the design arena. The sleek bath/shower combination is certainly heaven-sent and the perfect solution for your modern and contemporary space. Budget limitations are likely to be an initial deciding factor when it comes to remodelling your bathroom or designing it from scratch. A bath/shower combination is first and foremost great value for money – making it a great money saver when it comes to the purse strings. Acrylic combos are easy to install, and product and plumbing costs are considerably lower than that of separate bath and shower installations. 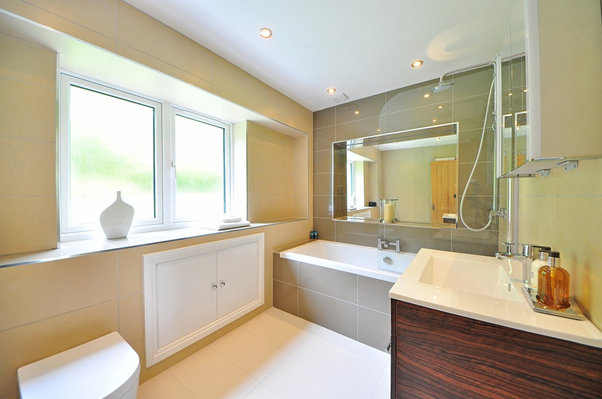 It is also considered to be a worthy investment in homes with only one family bathroom where it will reap further financial benefits when the time comes to sell your home. Let’s not overlook the obvious. Space saving considerations are key and rate high on design priorities. The world has certainly grown smaller and so have interior spaces. Bathrooms are often the first area where architects borrow square meterage. Most modern homes and city apartments offer limited space, but that is no reason to despair if your bathroom space is too small for a separate bath and shower. The bath/shower combination is the innovative design solution for functionality, practicality and efficiency, and now comes with many contemporary and customized options. It is not only the ideal option for smaller spaces and guest bathrooms, but has become a desirable inclusion in guest houses, bed and breakfasts and lodges. River Range’s exciting Angel bath and shower set. We are not kidding! The bath/shower combination could actually save your relationship! She loves a bath. He loves a shower. So who gets the final say when you are planning a bathroom remodel? You no longer need to flip a coin. The bath/shower combination is the ultimate peace-maker. And at the end of the day, you are upping your home’s resale value and everyone is happy (Even the kids). Whether you enjoy a long relaxing soak in a bathtub in the evening or a comfortable invigorating shower in the morning, the integration of the bath/shower combination will satisfy both preferences, providing the best of both worlds. 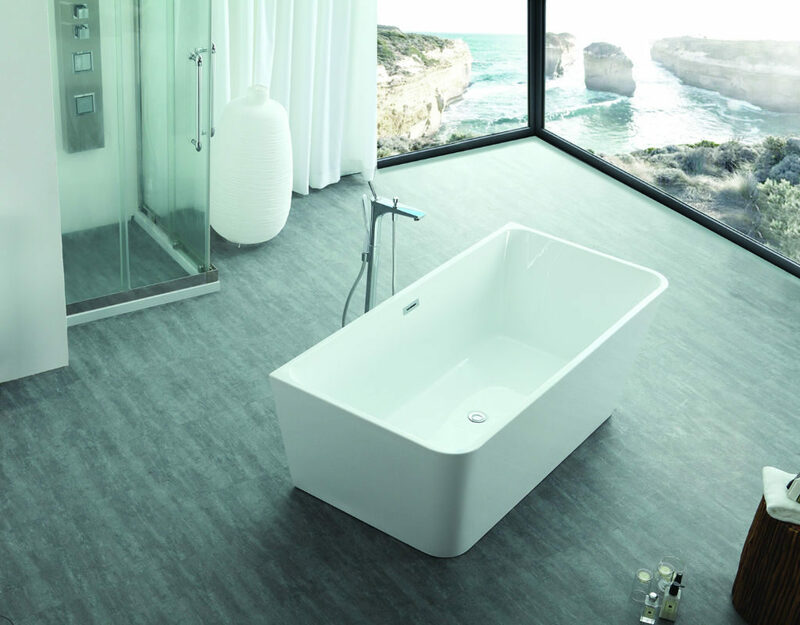 With a range of ergonomically-designed built-in, corner and freestanding bathtubs, River Range’s quality cross-linked acrylic bathtubs offer a wide range of shapes and sizes to suit a variety of design needs. The Angel bath and shower set is our newest addition and will radically change your perception of bath/shower combinations.Read more about the Angel set in our recent blog. To be further inspired by River Range’s ultimate and luxurious bathtub options, view our entire product range of built-in, freestanding and corner bathtubs. The bath and shower combo has become a popular and desirable option when it comes to the bathing experience for a home. These versatile units make the most of space constraints by offering all the benefits of both a bathtub and a shower in a compact footprint. River Range is proud to introduce the innovative Angel bath and shower set which provides greater flexibility for you and your family and gives the most functionality in a limited bathroom space. Shower screen made from tempered glass 1400 x 800mm. Chrome plated brass shower arm, rose, diverter mixer and spout. The inner curves of the Angel bathtub are designed to provide an upright backrest; a functional design unique to this model. This exceptional feature allows you to comfortably stand closer to the edge of the bathtub right under the extended arm and wide shower rose, for a fully immersive shower experience. This design also increases the space inside the Angel bathtub, giving your young ones plenty of room to play and splash about at bath time with enough room to bathe 2 children at once. The edge of the Angel bathtub has a 15mm pooling guard, an outer rim that encourages excess water to run off the edge and into the bathtub. This hygienic characteristic prevents water from pooling in the alcove between the bathtub and the wall, thus reducing the occurrence of mildew and mould in your bathing space. The Angel bath and shower set features a symmetrical bathtub and interchangeable shower screen. These allow you to install the set on either the left or right-hand corner of your bathroom, depending on what best suits your bathroom layout. Additionally, the Angel set is a space-saving combination unit that allows you to have both a bathtub and a shower in your bathroom without using too much of the precious real estate in a compact bathroom. This flexible, comprehensive multi-set is also built to suit your budget, at the affordable recommended retail price of only R9 200. This must-have set is available from your nearest DADO Africa approved sanitary ware retailer. Each of the items in the Angel bath and shower set are also available to purchase separately. 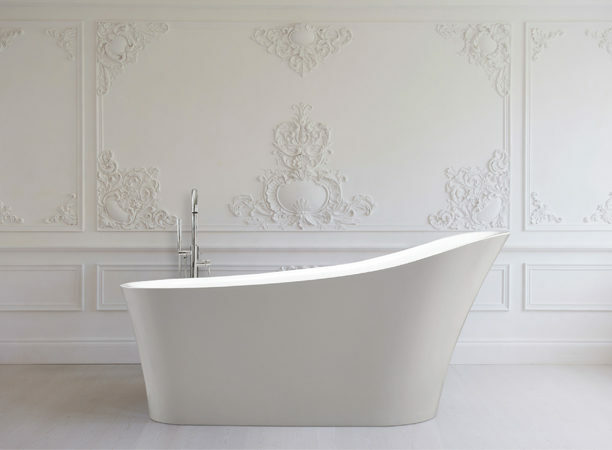 The Angel bathtub is especially designed with sleek thin edges, giving it an exquisite contemporary look. To achieve a sleek design, the pipes connecting the shower head, bath spout and diverter mixer are concealed behind the wall; and the tempered glass shower screen is frameless for a clean, minimalist aesthetic. The Angel set is the perfect modern centrepiece to bring a touch of affordable luxury to a modern family home in the city or a boutique hotel. Visit us at the DADO Africa showrooms in Centurion or Cape Town to view the River Range Angel bathtub and shower set, you can also find us at www.riverrange.co.za or contact us directly on 012 803 9431 and support@dadoafrica.co.za. How do you design a traditional and romantic bathroom space in a modern age? The answer is simple – roll top and clawfoot freestanding baths. They are versatile statement pieces that have stood the test of time since the mid-18th century and are once again making a resurgence in bathroom design in the 21st century. The Victorian era is renowned for being a bygone era of classic and timeless romance. The one feature that highlighted this more than any other is the visual and aesthetic statement of the roll top and slipper freestanding baths with decorative claw feet. River Range’s collection of freestanding baths proudly boasts two roll top, clawfoot baths – the Gila and the Orange Slipper – adding beautiful luxury and graceful elegance to your bathing space. Both bathtubs can be tailored and styled to suit a traditional or contemporary bathroom. Who needs the dashing Mr. Darcy when you can be swept off your feet by the Gila freestanding bath with a choice of black, white or silver decorative feet? The acrylic high gloss finish and roll top edge augment the aura of romance that is naturally invoked by such a pretty bath. As a the term freestanding suggests, this bath is beautifully finished on all sides, and can be shown off, in all its splendour, in any position in your bathroom space. Named after the river which winds its way through the desert regions of Arizona and New Mexico, the Gila bathtub adds a sense of grace and poise to your bathroom. 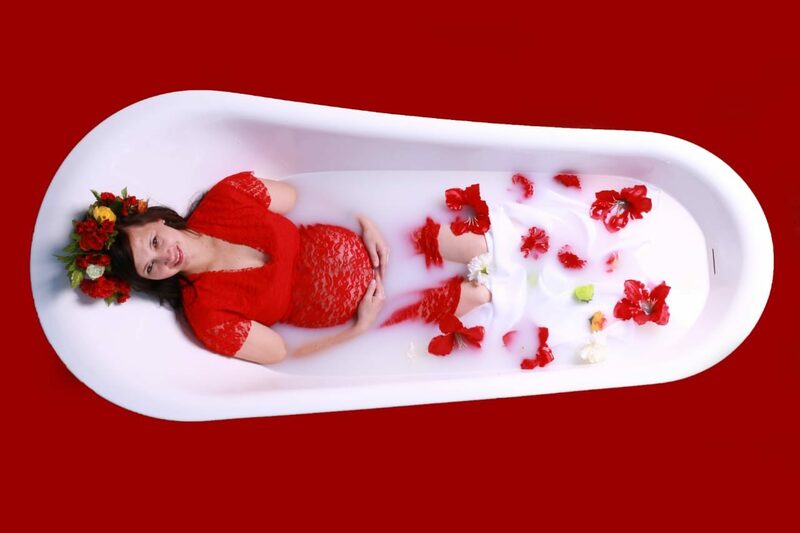 It lures you into a romantic and leisurely soak. For an ultra-romantic and elegant statement, the Orange Slipper freestanding bath with claw feet beckons. It will naturally become the decorative centrepiece of any bathroom space that desires a classical serving to soften up the contemporary style. Slipper baths are not only a popular design choice for their visual appeal, but also offer the ultimate experience in comfort and style. 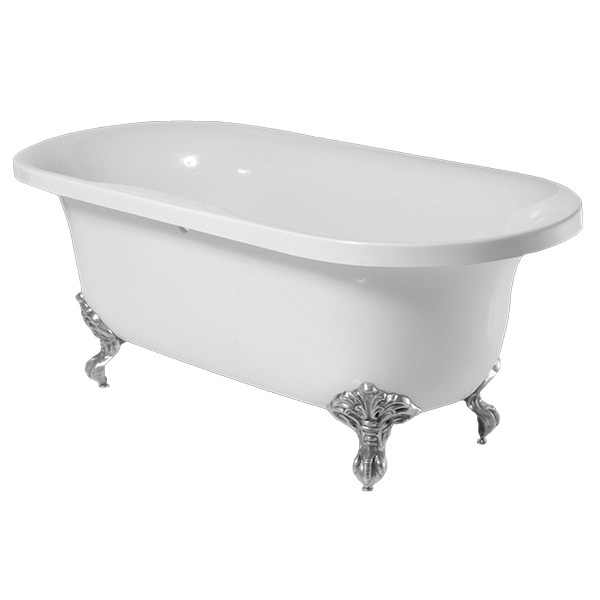 The slipper bath’s timeless features beautifully complement any modern space. Perched on ornate claw feet in your choice of silver, black or white, the Orange Slipper bathtub curves up on one end like a Victorian satin slipper. Relaxation is the keyword when it comes to slipper freestanding baths, allowing you to rest your head and linger for longer. As you lie back, your mind can be transported to Downton Abbey style manor houses, complete with crackling fireplaces and ladies-in-waiting. Named after South Africa’s longest river, the distinctive shape of the Orange Slipper freestanding bath will draw the eye and be a classic and timeless addition to your personal sanctuary. Named after the iconic rivers of the world, River Range’s top-quality acrylic bathtub brand has grown into a comprehensive range of baths and distributed to various countries in Africa. Our ergonomically designed bathtubs offer intimate bathing experiences, focusing on relaxation, comfort and affordable luxury. All of River Range’s built-in, corner and freestanding baths are backed by a 10 year warranty. Visit us online to view all our baths that will add style to any traditional or contemporary bathroom. Modern times have reshaped the bathroom into a personal sanctuary and a place of wellness – a space that is devoted to relaxation and pampering. River Range offers this luxury with our range of freestanding baths, inspired by iconic rivers of the world. All our bathtubs prioritise spaciousness, elegance and comfort, so you can have a place to revitalise your body and mind as if you were at a river retreat. Rivers have always symbolised life and inspired wonder. They are the point of attraction around which settlements and cultures originated, and a place to be re-energised. This has been the overarching vision behind River Range’s bath creations – with each model named after a regal river of the world. 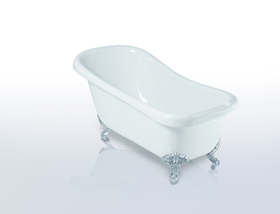 To read more about our wide range of River Range bathtubs and their inspiration, visit our blog. Freestanding baths come in all shapes and sizes – round, oval, square and rectangle – each with its own design charm, character and functionality. Lets begin with the rectangular shaped bathtub. 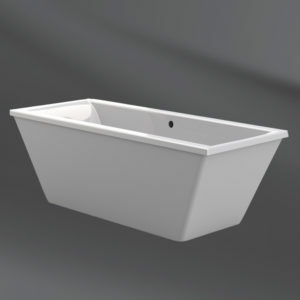 This is the the most traditional and common shape for bathtubs as it offers adaptability to virtually any bathroom layout with numerous installation options. The perfect lines and shape of the Jordan make it the quintessential bathtub. This is a design choice that will add simple and understated elegance to your modern bathroom space. This beauty was named after the historically important Middle Eastern river, the Jordan, which has religious significance and has inspired spiritual and cultural hymns and songs over the years. This winding and sacred river has garnered much affection and been revered by pilgrims across the world. The Greeks, named it the “Aulon” and the Arabs referred to the river as “Al-Shari-ah,” which means “water place.” It has also symbolised transition, hope and promise and that is exactly the experience you can expect when you relax in the Jordan freestanding bath. The Narmada bathtub is a magnificent, freestanding bath with a rectangular shape that gently drifts outwards towards the top. Featuring sleek, simple lines, the Narmada will bring a striking presence into any modern bathroom. The Narmada River – the namesake of this stunning bathtub – emerges from central India. This river is considered to be the most sacred of all the rivers in India and holds a rich,cultural significance across the entire country. Locals have many legendary tales and ancient manuscripts signifying the importance of the Narmada river. One particular story tells of how looking into the river, alone, can rid a person of all his bad karma. According to the locals, when the River Ganga, a trans-boundary river feels polluted, she comes in the form of a black cow to have a purifying bath in the Narmada River. As you soak in River Range’s Narmada freestanding bath, that all-encompassing sense of purification, refreshment and serenity can be yours too. All of River Range’s freestanding baths are manufactured from the best cross-linked acrylic in the market, making them high-quality, chemically stable and 17 times stronger than glass. Their easy-to-clean high-gloss finish ensures that they look sparkling new for longer. Our freestanding baths, alongside our built-in and corner baths, are backed by a 10-year warranty. 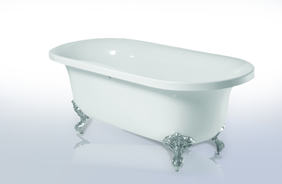 To view all our River Range bathtubs, visit us online or find a store near you today. Acrylic modern bathtubs, whether freestanding, built-in or corner units, are winning concepts in the world of bathtub design. The modern acrylic bathtub is a far cry from the original bathtub, designed by John Michael Kohler in 1883, who innovatively up-cycled a cast-iron horse trough by adding four decorative feet to the bottom of it and covering it in an enamel finish. The evolution of the modern acrylic freestanding bath has added affordable beauty and style to the contemporary bathroom, offering a myriad of benefits. If you are renovating or designing a bathroom from scratch, the decision of which bathtub to install is always greater than simple aesthetics. It considers the functionality of the design, and the longevity of the modern bathtub you want to install while keeping budget constraints in mind. The ultimate advantage of a modern acrylic bathtub is the flexibility that it offers with regards to size and dimensions. They are available in a variety of shapes and sizes to adapt to any spatial constraints. 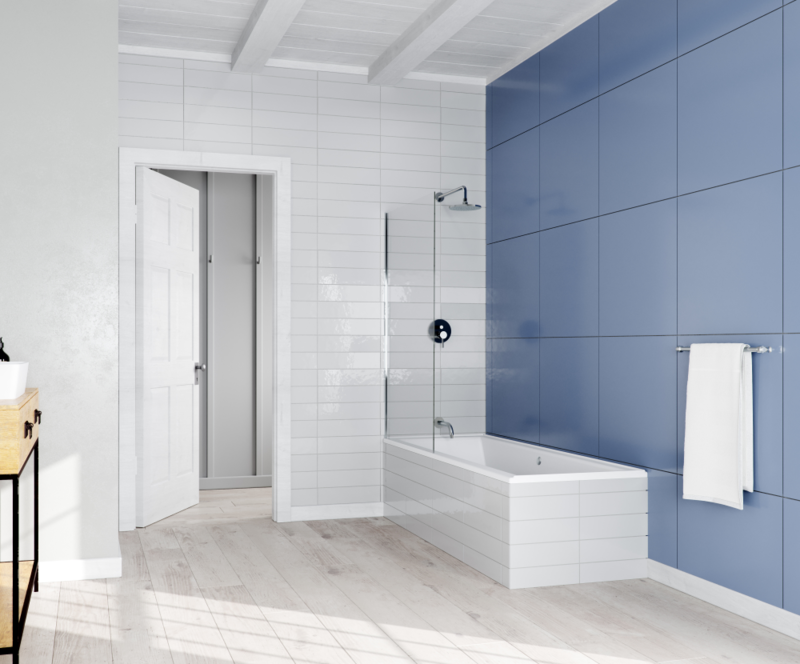 Whether you prefer an acrylic freestanding bath, a built-in bath or a corner bath, there are ample products on the market that will fit your specific design and use needs. An acrylic freestanding bath combines sculptural design and placement flexibility while corner and built-in bathtubs require framing, and need to be encased and tiled. Our previous blog article on the recently launched Yukon freestanding and built-in bathtub highlighted the ability of a single acrylic model to serve as both a built-in and freestanding bathtub to meet the homeowner’s needs. Besides their striking high gloss finish and luxurious, smooth, surface, modern bathtubs made from acrylic material have excellent heat retaining properties which allow you to soak in comfort for much longer. If you desire enduring quality, distinguished longevity, adaptability and visual appeal in any size bathroom, then look no further than River Range’s acrylic modern bathtubs. Our ergonomically designed styles and various shapes and sizes are developed to suit your needs. River Range offers a bespoke selection of freestanding baths, built-in baths and a variety of corner bath configurations ranging from modern to classic designs. All our baths are backed by a 10-year warranty as a testament to their quality and durability. At River Range, our top quality range of acrylic modern bathtubs will leave you spoilt for choice. Established in South Africa in 2011, the brand has grown into a comprehensive range of acrylic bathtubs distributed to various countries in Africa. Made from the best cross-linked acrylic available on the market, our baths are not only tough, but they add glamour with lavish designs and beautiful high gloss finish. For more details on our individual products, please download our brochure or consult our store locator to view our product range at your nearest outlet.